Thank you to all who came out for the book signing/opening Friday night! I was so happy about the turnout and for the experience of working with Ade Tugbiyele, who so generously did the hanging of the work. Please spread the word that the show will be up and the book available at the Creative Alliance, Baltimore, through March 23. Titles are listed below; pigment prints (2013) on Hahnamuhle Photo Rag Matte paper, R1800 Epson printer, sizes are of images. Canvas and wood pieces priced separately. Our governor and his Irish band will be playing there next weekend and we’ll be back for that. Happy Saint Patrick’s Day to all! Merry Christmas and Every Other Celebration! My Book - Coming in January! Well, the semester has ended, and we did not quite get the book completed. I will be doing much over the break to get it ready and we will have it out by the end of January! A very merry holiday season to you all and many blessings in the new year! All great nations with ancient histories in the world had strong oral traditions that kept the culture’s memory alive through poetry and song. In Ireland, the only country whose national symbol is a musical instrument, history is still contained in its musical traditions. Traveling storytellers, the seanachais/shanachies, carried Irish history throughout the landscape, one household hearth at a time. When written language emerged, it was an ecclesiastical skill, and the history of Ireland (and the world) was preserved in the monasteries in exquisite hand-scribed and illustrated handmade books. For many centuries the clergy were the only literate people, having studied abroad for the priesthood. When education was forbidden for Catholics, children were taught secretly in open fields, thus learning to speak, read and write Irish in tandem with learning the history of their country. The arrival of Ireland’s first populations is steeped in mysticism and lore, as much a part of the poetic tradition as the sacred spirit of the place. Dugout canoes, simple boats made of branches covered with stretched animal hides (coracles) and similarly made rowboats that could travel greater distances (currachs), were used from the first century into the twentieth century, particularly on the west coast near the Blasket Islands, which is still fairly remote and where Irish is still spoken. Legend has it that Saint Brendan sailed in A.D. 500 in a currach all the way to the continent that eventually became America. Exquisite bronze, gold and iron works, examples of which are held in the major museums of Ireland and England, were made surprisingly early. Ornate brooches held capes in place, jewelry (arm bands, collars, earrings, clothing fasteners), decorative weapons and cauldrons, elaborately illustrated monastic texts (Book of Dimma, Book of Kells), handheld bells, missals and jewel encrusted box shrines that contained them were discovered at various times throughout the nineteenth century. An ancient book, the Fadden More Psalter, found preserved in a bog in Tipperary in 2006, is now on display in the National Museum of Ireland. The collection of antiquities there is stunning, testifying to the extremely high level of Irish craftsmanship that existed even in Neolithic times (3600 – 2800 B.C.) Very thin sheets of gold were fashioned into ornamental round and crescent-shaped discs embossed with geometric patterns, likely worn over clothing as collars signifying rank and status during the Early Bronze Age (c. 2200-1800 B.C.). By the Middle Bronze Age goldsmiths could twist long thin bars into delicate spiral necklaces. In the first century B.C. craftsmen could already work with glass. Delicate as a pod and about the size of a half mango, a small golden boat sculpture (likely representing a currach) is among the treasures attributed to the first century B.C. Several tiny oars extend from each side, a crossed mast points upward and eight seats span its width. The Museum holds several ornamental shrines and brooches, including the Tipperary and Roscrea Brooches, the Killamery Brooch (Kilkenny) and the magnificent Shrine of Saint Patrick’s Bell (1100 A.D.). The Clonmacnoise Crozier is there (11th century) and the Ardagh and Derrynaflan Chalices (8th and 9th centuries, respectively). Ireland was divided into the provinces of Munster (Southwest), Leinster (Southeast/East), Connaught (West), Ulster (North) and centralized Meath/Mide, which later became part of Leinster. The areas now contain several counties each, and particular surnames are still associated with them. The original Irish, rural and tribal, functioned amid complex layers of leadership. Families shared and worked their lands communally using natural fluid land formations as designated perimeters of their properties, which extended great distances. Each of the major Gaelic tribes had their own King, under which were Ruling Lords who oversaw a number of Noble Chieftain families, who in turn had their own subjects. Extended family groups were called tuathas (i.e “people/community”) . Although the various kings and chieftains in the tuathas continually vied for power and property, the Brehon Laws covered non-religious conflicts within the separate petty kingdoms. Every person had an “honor price” based upon their importance in society, and punishments were decided according to the honor prices of both sides in a dispute. According to Kane’s Ancestral Map of Ireland (Kane Strategic Marketing, Inc., P.O. Box 781, Harbor Springs, Michigan, 49740; Limerick, Ireland, 1993), some ancient Mahers were also descendents of Cormac Mac Art and Conaire Mor, both descendents of Heremon. Cormac Mac Art was the son of King Art Eanfhear, Monarch of Ireland A.D. 227 to A.D. 266. (The chapel of Cormac Mac Art at the Rock of Cashel is presently being restored.) Eanfhear was the son of King Conn of the Hundred Battles, Monarch of Ireland A.D. 166 to A.D. 195 (or, from another source, A.D. 123 to A.D. 157). The lineage of Conaire Mor appears to have died out. He had been “sixteenth in descent from Heremon” and his line included King Conaire the 2nd, Monarch of Ireland A.D. 157 – A.D. 166. (Shaw) The Meaghers/Mahers appear on the map within the barony of Ikerrin. Third century King Cormac Mac Art attempted to unite all of Ireland with Tara as its center, but there would be no overarching King of Ireland until Brian Boru overcame the O’Neills in 1005. Boru briefly united all the counties of Ireland by claiming the High Kingship until his death in 1014. Kings: Tipperary (Kings of Cashel) – MacCarthy, O’Brien, O’Callaghan. Princes: Tipperary – O’Carroll, O’Donnegan, O’Donohoe, O’Brien; Kilkenny – O’Carroll, O’Donaghue; Queen’s County – MacGilpatrick (Fitzpatrick). Ruling Lords: Tipperary – MacBrien, O’Cuirc (Quirk), O’Day (O’Dea), O’Dinan, O’Dwyer, O’Fogerty, O’Kennedy, O’Meagher (O’Maher), O’Sullivan; Kilkenny – O’Brennan (Fassadinen area), O’Brodar; Queen’s County – O’Dempsey, O’Dowling, O’Dunn, O’Moore. 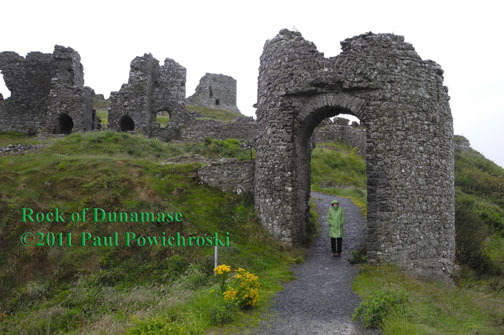 While it is impossible for anyone today to genealogically prove their lineage back to ancient Ireland, appreciating the long reach of some clans’ emotional ties to their homeland may help, by extension, to put in context the rebellious feelings that many had toward the waves of newcomers who displaced them, became their landlords, and/or forced their own ancestors to permanently flee to other countries or relocate to barren parts of the island. Chambers, Anne, Ireland’s Pirate Queen, The True Story of Grace O’Malley, New York: MJF Books, 2003. Frank Delaney, Ireland, New York: HarperCollins Publishers, 2005; Tipperary, New York: Random House, 2007; Shannon, New York: Random House, 2009. John Maher, The Luck Penny, Britain and Ireland: Brandon, 2007. Edward Rutherford, The Princes of Ireland, The Dublin Saga, New York: Ballentine Books, 2004; The Rebels of Ireland, The Dublin Saga, New York: Doubleday, 2006. In ancient times the land divisions of Ireland were very different from the way they appeared in post-Norman centuries, when a modern sense of town layout and clear parameters had been established. Ikerrin (Ui Cairin), an area extending between Munster and Leinster, was localized as the northeast corner of Tipperary with land subtracted into King’s and Queen’s Counties in 1556 by Queen Mary, creating Offaly and Laois, respectively. Just over the border of both Tipperary and Laois is the county of Kilkenny. Towns within and between all these counties are easy to reach by car and were likely commonly traveled by foot, horse and cart or bicycle centuries ago. The sept, or clan, Meachair/O’Meagher originated in Ikerrin. Its primary town, anciently called Muscraighetire, where the barony of lower Ormond (Butler) became situated, was called Ros Cré (“Wood of Cre”) now Roscrea, Tipperary. A landmark in the area, which can clearly be seen from the Rock of Cashel, is the gap in the Slieve Bloom Mountains called “The Devil’s Bit,” near Templemore, Tipperary. Lore explains the nickname from a story that the devil, frustrated that he could not tempt the devout residents of the area, took a bite out of the mountain and spit it eastward, forming the foundation of the Rock of Cashel. 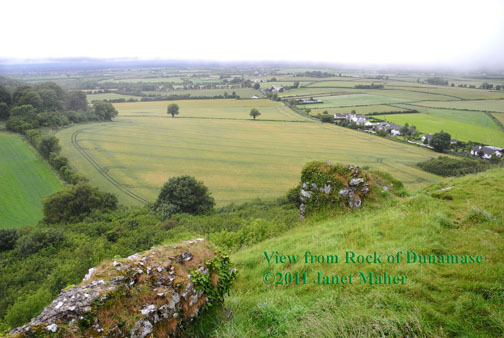 A second version of the story attributes the removed portion as having formed the base, instead, of the Rock of Dunamase in Laois (Queen’s County). A gift from Leinster King Diarmuid mac Murchada (Dermot MacMurrough) to Strongbow (Richard fitz Gilbert de Clare) as part of the agreement that opened the door to the Normans’ entry into Ireland, this castle was destroyed by Oliver Cromwell in the mid 17th century. 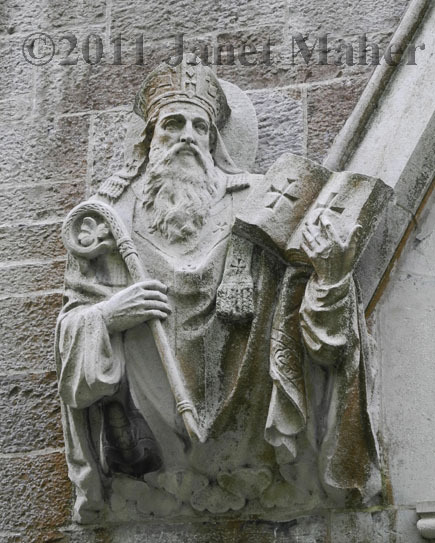 Saint Cronan founded a monastery in Ros Cré in 606, called Inchinamo. Ruins of the Irish Romanesque abbey are near the Saint Cronan Church. The original sandstone church had a round tower, a carved high cross, medallions and other relief carvings depicting knots, Noah’s Ark, and the first abbot. In the 8th century another monastery near Roscrea, Inchanambeo, was founded on an island. This church lasted at least to the early 12th century when it was mentioned in the Annals of the Four Masters. A cell within Inchanambeo was called Toome. The O’Meaghers owned many castles throughout Munster and Leinster associated with abbeys or churches and there were many notable members of the clergy in the sept. The Mahers commonly intermarried with members of the Butler dynasty, which ensured some degree of survival, if not financial security in difficult times. Almost all Gaelic families had lost their property by the seventeenth century either through inter-tribal battles, English confiscation, banishment from Ireland before or after the devastating conquest of Cromwell, or through dispersion, willingly or unwillingly, throughout the southern counties of Ireland and the world. The name Maher is still primarily associated with Tipperary, although it extends into Kilkenny, Laois, Offaly, Carlow, Waterford, and elsewhere. All Mahers, wherever they may have put down new roots over the many centuries, and no matter how their name is spelled today, essentially originated in Ikerrin, although ancestry directly leading back through the ancient generations is, of course, impossible. As one of the noble ancient Gaelic families, pedigrees were created for the surname, and O’Meagher included several of them in his exhaustive research (pp. 191-205). I consider his book, Some Historical Notices of the O’Meaghers of Ikerrin, to be the bible about Maher, a first resource in beginning to study the ancestry of the name. It is in the Public Domain and available printed on demand through Amazon. 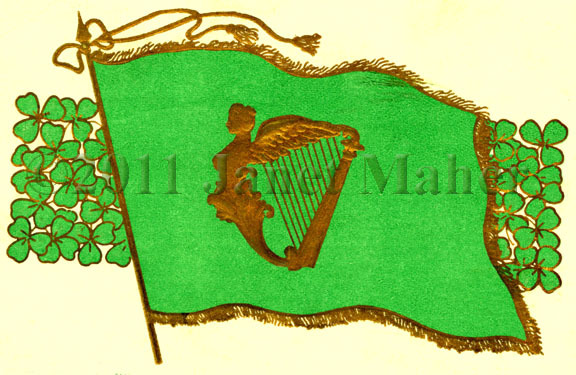 Maher/Meagher is an ancient Gaelic Irish surname that extends through the arrival of the Vikings and Normans, actively appearing in Irish history ever forward to the present. 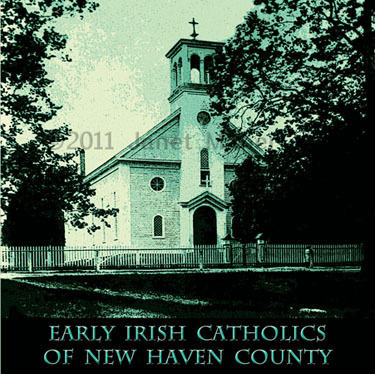 My own extensive study of the Maher clan both in New Haven County, Connecticut and in Ireland has grown greatly since 2006, extending sideways into the time and circumstances in which our ancestors lived before and after their emigrations. My family’s connection to the Butler clan has led me to also research the phenomenon of the Anglo-Irish, which inevitably revolves around the issue of Catholicism. Gaelic Irish Catholicism, governed by the Brehon Laws, within which priests could marry, women had significant power, and divorce was allowed, was greatly changed through English influence. Methodical colonization and conquest resulted in the loss of ancestral Irish lands and a nation’s civil rights as religion was used as a weapon against the native people. A recent pilgrimage to the land of my ancestors, the midlands of Ireland, has convinced me to offer some of my research in a blog format. Here I may explain in one place what I have found myself repeatedly attempting to share with others. Countless hours of study and miles of travel have resulted in an office full of information that must somehow be published. I intend to do this responsibly, with the goal of enabling others to progress without having to recreate their own wheels, as it has seemed that I have had to do. Here I will not need to worry that my writing is too long, too scholarly, does not fit a particular style, or is too Maher-oriented, and those who are interested in the topic will no doubt find me. René Daumal explained in his allegorical Mount Analogue (Baltimore, MD: Penguin Books, 1974, pg.116) the importance of providing guideposts for others as one trail blazes a chosen mountain. While it is critical to leave clues along the way to aid in one’s own return, it is also important to remove any marks that might confuse someone else who might follow one’s path. “Be ready to answer to your fellow men for the trail you leave behind you,” he urged. With that in mind I will be careful to share that which seems pertinent to the general focus I have established, will serve a general interest, and will illuminate the paths I have taken to arrive where I have. In gratitude to those who have served as guides for me I offer this blog. I hope that it will advance others’ research and perhaps one day circle back into mine. We who do genealogical research become experts about our own lines, usually to about the level of second great grandparents. If one’s Irish ancestors have historically been Catholic, the search for data is particularly difficult. However, for those researching a particular surname, area and time period, I am convinced that if we collectively get back far enough the connections will appear. May we continue to find them and, most importantly, enjoy the process!